South Dakota Birds and Birding - One Million Visitors!!! A Recognition that Respect for the Natural Environment Outweighs the Photographer's Desire to "Get the Photo"
When I was a kid, I loved watching "nature" shows. We didn't have the Discovery Channel, Animal Planet, or any channels specifically devoted to this type of programming. Once a week, we had "Mutual of Omaha's Wild Kingdom", with Marlin Perkins. I absolutely loved it!! I imagined myself growing up and having the adventures that Jim Fowler had on the show. It took a while, but in 2001 I discovered the joys of birding and bird photography. It's "only" a hobby, but I consider myself extremely fortunate to have at least partially lived out the dreams I had as a child. I treasure my time in the field, not just for the photography, but for the many and varied "adventures" I've had. 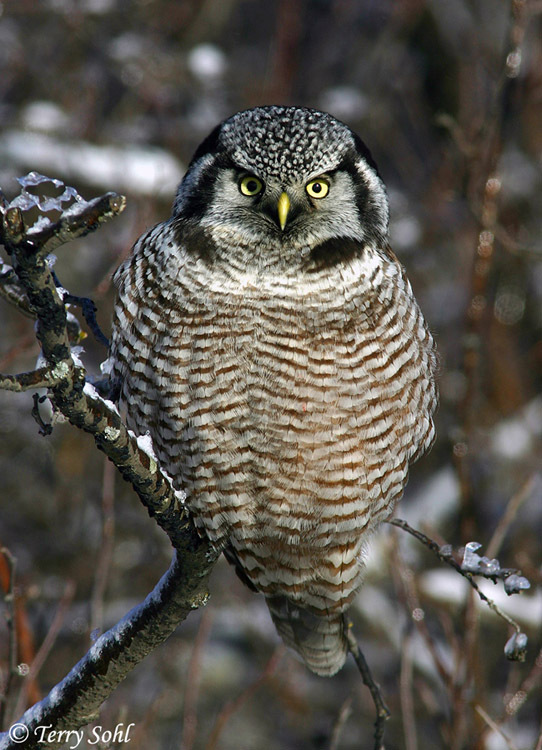 The Northern Hawk Owl shown at the left is from one of these adventures, a trip to Sax-Zim Bog in Minnesota in the winter of 2004-2005 when an incredible southern irruption of northern owls occurred. It's a trip I'll never forget. Unfortunately, during many of these adventures, I've learned what passes for "nature" photography for some photographers. The trip to Sax-Zim Bog was not only thrilling for me, but also slightly disturbing. Owls were everywhere on this trip and photo opportunities were numerous, but yet some photographers weren't satisfied. On multiple occasions, I came across "photographers" pulled to the side of the road, using live mice in an attempt to get a perched Northern Hawk Owl or Great Gray Owl to fly down and grab it, resulting in an easy, and dramatic photo opportunity. I also came across multiple dead owls on the side of the roads, and I couldn't help but think that baiting owls and teaching them to associate roadsides and humans with food probably contributed to their deaths. Baiting owls with live mice is only one of many "photographic techniques" that I've learned about over my years as a photographer. Now when I see a truly incredible photos, my first thought is how "real" that photo is, and what technique was used to get it. My "Wild Kingdom" show I loved as a kid? I've since learned just how "natural" those video sequences were, as most were heavily staged. Here's just a sampling of some tricks I've learned "nature" photographers use to get a photo. I would shudder at the use of some of these techniques, just because of the harm they may cause the bird. Beyond that, other techniques here may be a bit less distasteful, but you'll hardly ever see a "nature" photographer directly admit the use of one of these techniques in association with a particular photo. 1) Baiting with live prey - Ever see a photo of a Snowy Owl, Northern Hawk Owl, or Great Gray Owl moving towards the camera, talons extended, just about to pounce on something unseen in the snow? You can bet that nearly all of those photos were obtained by photographers using live mice to entice the owl. There are "Winter Owl Tours" that specifically lead photographers around in Canada and use this technique to grab some great "nature" shots. I simply can't imagine using this technique, as 1) I couldn't sacrifice a live animal and 2) it's potentially very damaging to the bird, especially since the technique is often used on relatively rare raptors. I find this technique particularly disgusting, especially since the photographers who use this technique rarely, if ever, let viewers of their work know how the photo was obtained. 2) Use of digital bird calls - With iPods and birding software available that provide digital recordings of bird songs and calls, it's now extremely common to find not only photographers, but birders, using digital playback of bird songs to lure birds closer. 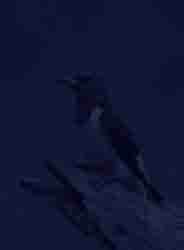 My first experience of it was when a rare bird for South Dakota was found, and I went to try and photograph it. When I arrived, a guy walking up the path said "Do you want to see the Prairie Warbler"? I said OK, and he pulled out an iPod and a tiny set of speakers. He played a bird song, the Warbler flew down in response, and I got several photos. My first thought...How very cool!! Without the digital playback, getting a photo of that bird would have taken a lot of patience, and a bit of luck. With the call, it was extremely easy. I admit I had short period after that where I was enamored with the technique. There is NO doubt that MANY, MANY bird photographs you see from nature photographers were obtained by luring birds closer with this technique, as it's extremely, extremely effective. However, I soon realized two things 1) I simply wasn't having nearly as much fun using this technique, as the challenge was completely gone, and 2) I began to read about the potential negative effects of using digital calls and songs. Birds that are distracted by a host of electronic bird calls are birds that aren't behaving naturally. My temporary infatuation with the technique soon faded to disdain, especially after I saw SO many birders and photographers using taped calls, and how much it affected the behavior of the birds. 3) Use of dummies/fake birds - This is often done in association with the use of digital bird calls. Do you know the fake plastic owls you sometimes see on the top of signs or buildings, the ones meant to scare away birds? Many birds react VERY strongly to the presence of an owl. When a real owl is present, other birds (and potential prey!) that spot the owl often participate in a "mobbing" behavior, with birds approaching relatively close to the owl to scold it, sometimes even dive-bombing it in an attempt to drive it away. Some photographers use fake owls, often in association with digital owl calls, to lure birds closer so they can photograph them. There are evidently some species that react much more strongly than others to this technique, including both songbirds, and many small raptors. 4) Staged setups - Ah, Marlin Perkins, you've broken my heart. As I stated above, a great deal of the footage on "Wild Kingdom" was heavily staged, as captured or semi-tame animals were released in very controlled environments. The tradition definitely is still going strong today. Some of my least favorite "nature" photos are the "bird-on-a-stick" (BOAS!) photos, where you have a very "clean" photo, consisting of a very clean background, a simple and often extremely attractive perch, and the bird. These photos are popular with not only photographers, but websites, magazines, and advertisors who may want those photos, as the uncluttered and simple look is advantageous when you also need to place text with the photo. You certainly can get that type of photo "naturally", but MANY photographers use heavily staged setups. Put a food source such as fruit or seed in an area, set up an extremely attractive (and often unnatural looking, at least to me!!!) perch nearby, and wait for the bird to approach and land on the perch. A very common technique. 5) Hummingbird Photography - I consider hummingbird photography as deserving of it's own category as "staged setups". For some background...I'd never been in Arizona until my family took a vacation there several years ago. I immediately fell in love, and we've been back a few times since. One of the great attractions for me is the opportunity to photograph hummingbirds, as there are potentially so many species you can photograph, especially in areas like Madera Canyon near the Mexican border. A cottage industry for hummingbird photography has developed, where a "standard" hummingbird photography technique is almost now established. It typically involves 1) a food source, typically a beautiful flowering plant that's purchased and brought on location 2) elaborate multi-flash setups to try and "stop motion" for hummingbirds in flight, and 3) fake, artificial backgrounds. The technique...show up where the hummingbirds are found, set up your potted plant and flash set-up, and place the artifical background opposite of the camera. The result...you'll see some truly gorgeous photos of hummingbirds, often consisting of just a single flower and the hummingbird, with a wonderful, clean and smooth background. Now I can't look at a beautiful hummingbird photo and wonder if the background is real, or if it's a fake cardboard painting behind a heavily staged setup. 6) Nest photography - Ok, so "nest photography" isn't a technique in itself, but it deserves mention here. I now have something like 5,000 photos on this website (what can I say, I'm nuts). 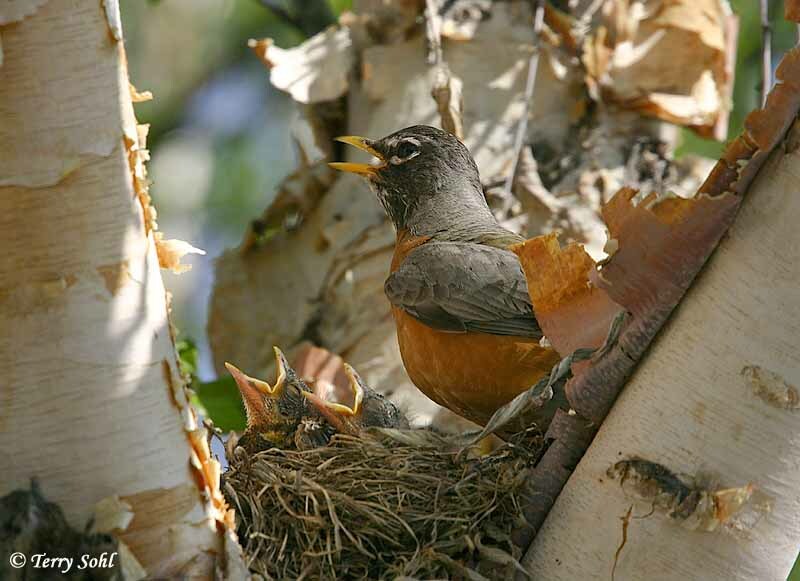 I can only recall one situation where I've ever photographed a nest with young in it, and that was when an American Robin built a nest in the crook of a tree next to my driveway. 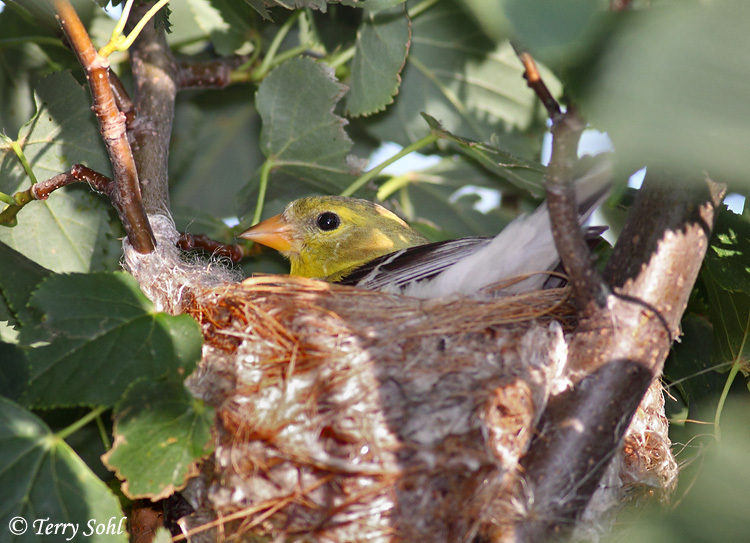 Other than that, I have one photo of a Broad-billed Hummingbird sitting on a tiny nest (and ONLY one quick photo, as I didn't want to disturb her), and a photo of an American Goldfinch sitting on a nest in my yard. I believe that's it!!! I just do NOT like nest photography, as it's far, far, too much of a risk that you'll disturb the parents or young. 7) Digital Alteration - Oh my goodness, I could fill webpage after webpage on the things photographers do to digitally alter their photographs. It's just so much easier to edit a digital photo than it was in the film days. This is a topic too huge to discuss here, but know that very little seems out-of-bounds for some photographers. Editing the background, digitally erasing selected undesirable features, or even merging results from 2 different photos are all things that are very commonly done. This just represents a partial list of photographer's tricks. For me it's quite simple. Nature photography should be about recording events and subjects in the natural environment. The nature photographer should have upmost respect for his/her subject matter, and value the resource more than the photo itself. A nature photographer should never do anything which threatens the very resource they're trying to photograph. As with any endeavor, I've improved and evolved since I first took up birding and bird photography. As I've learned the craft, I admit I have tried a few of the techniques listed above. It's not necessarily a black-or-white issue as to whether the techniques above are "good" or "bad". As mentioned above, I went through a short period of using digital calls. I still do occasionally scatter seed on the ground to attract birds for photographs. I'm not very good with Photoshop and typically limit my digital editing to contrast, cropping, or other basic functions, but on rare occasions I've liked a special photo enough to digitally alter an undesirable feature, such as digitally removing an out-of-focus twig or leaf that distracts from the main subject. However, one thing I've learned over the years is to value the resource (the birds themselves) more than the photography. There are many, many occasions where I have abandoned a promising photo opportunity because I've felt my presence or approach was too disruptive to the bird. My aim is to assure that the visitor to my website doesn't have to wonder whether I've used live prey to attract raptors, whether the photo has been extensively digitally altered, or whether the "habitat" in the photo is real, or heavily staged. My ultimate goal is to provide Nature Photography - Done Naturally.